Doctors, environmental groups and California officials will weigh in on the Trump administration's proposal to roll back car-mileage standards at what could be a raucous hearing in California, where some of the nation's worst air pollution occurs. FRESNO, Calif. (AP) — California officials demanded Monday that the Trump administration back off a plan to weaken national fuel economy standards aimed at reducing car emissions and saving people money at the pump, saying the proposed rollback would damage people’s health and exacerbate climate change. Looming over the administration’s proposal is the possibility that the state, which has become a key leader on climate change as Trump has moved to dismantle Obama-era environmental rules, could set its own separate fuel standard that could roil the auto industry. That’s a change the federal government is trying to block. “California will take whatever actions are needed to protect our people and follow the law,” Mary Nichols, chairwoman of the California Air Resources Board, testified at a hearing with federal officials in a region of central California that has some of the nation’s worst air pollution. State Attorney General Xavier Becerra said California could not afford to retreat in the fight against climate change, citing wildfires and high asthma rates among children in the state’s San Joaquin Valley, where residents, environmentalists and state officials testified at the first of three nationwide hearings on the mileage plan. “Stopping us from protecting our people, our jobs and economy or our planet is like trying to stop a mother from protecting her child,” he said. The proposal announced in August by President Donald Trump’s administration would freeze U.S. mileage standards at levels mandated by former President Barack Obama for 2020. The standards regulate how far vehicles must travel on a gallon of fuel. Under the deal finalized under Obama, the standard would rise to 36 miles per gallon (15 kilometers per liter) by 2025, 10 miles per gallon (4 kilometers per liter) higher than the current requirement. Trump administration officials say waiving the tougher fuel efficiency requirements would make vehicles more affordable, which would get safer cars into consumers’ hands more quickly. A major auto industry trade group says it supports annual increases in fuel efficiency but won’t say by how much. Customers aren’t buying more efficient vehicles, Steve Douglas, senior director of energy and environment for the Alliance of Automobile Manufacturers, said in testimony prepared for the hearing. The group represents General Motors, Ford, Fiat Chrysler, Volkswagen, BMW and other automakers. Automakers are unanimous in favoring one standard for the whole country so they don’t have to design two vehicles, one for California and the states that follow its requirements and another for the rest of the nation. Scores of people opposed to the Trump plan testified before representatives from the U.S. Environmental Protection Agency and National Highway Traffic Safety Administration, including local residents who said it would worsen their asthma. More than 130 people, including doctors and electric vehicle advocates, had signed up to speak before the hearing ended. 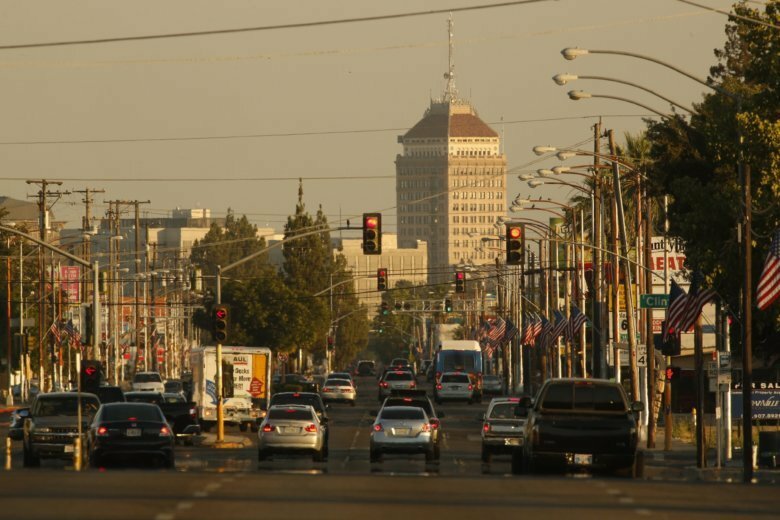 It was held in California’s San Joaquin Valley, the country’s most productive agricultural region but an area plagued by sooty air in part because of its bowl-shaped geography. The Sierra Nevada and two other mountain ranges wall in the 250-mile (400-kilometer) valley. Air pollution there is blamed for hundreds of deaths each year. “We are asking the EPA to represent those of us who have asthma and respiratory disease,” said Janet DietzKamei, 73, a member of the Central Valley Clean Air Coalition. DietzKamei said she is unable to leave her Fresno home on some days because the air is so polluted. Paul Gipe, 67, and his wife, Nancy Nies, 69, drove from the city of Bakersfield to join the demonstration. “It’s a step backward, and it’s a statement that air pollution is acceptable. Damn the people, full speed ahead,” said Gipe, who writes about renewable energy on his website. An avid bicyclist, Gipe said there are days he can’t ride because the air quality is so bad in his hometown. California and other states have sued to block any changes to Trump’s proposal. The administration also wants to revoke California’s authority to set its own mileage standards. “We have plans to meet it,” he said. The Obama administration had planned to keep toughening fuel requirements through 2026, saying the stricter standards would save lives. Trump administration officials argued they would raise the price of vehicles by an average of more than $2,000. Transportation experts have challenged those arguments. Hearings are also planned on Tuesday in Dearborn, Michigan, and Wednesday in Pittsburgh. Auto Writer Tom Krisher contributed this report from Detroit.